Samsung has a catalog comprehensive and varied. The manufacturer clearly trying to be present on all fronts, according to Sam Mobile that it could soon raise the veil on a new range of touch tablets: the Galaxy Tab 3. A range that is apparently composed of three models since it would issue a three Galaxy Tab 7.0, Galaxy Tab 3 of 10.1 and a Galaxy Tab 3. Certainly, these next few weeks are likely to be very busy with Samsung and this is normal since the South Korean manufacturer should grant us a number of new mobile terminals among which we may mention the Galaxy S4, the Galaxy Tab 8.0 the Galaxy Pocket Plus and a lot of other nice things. 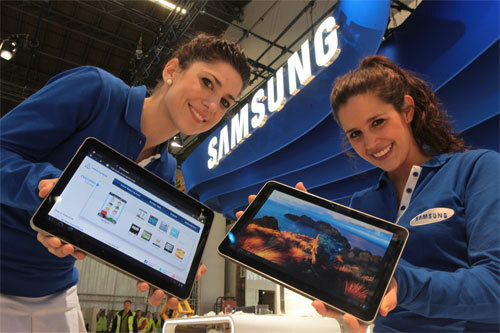 And if we believe this new rumor, then it would also be three new tablets that could land soon: Galaxy Tab 3. Samsung will soon launch a new range: the Galaxy Tab 3. As explained a little earlier, they would be available in three models. It would obviously matter a 7-inch slate and a 10.1-inch slate, but Samsung could also grant us a third tablet that also benefit a 10.1 inch screen. Bizarre, obviously. If Samsung has never been afraid of overburdening the market, the manufacturer did not used to launch two identical terminals in a single line. Would it be a new Nexus 10? Possible, but it will take to get to the bottom. Finally, we can also add that the new Galaxy Tab 3 should be divided into several models varying according to their storage capacity (16 GB or 32 GB) and their connectivity (3G or not), all for an arrival on the market the first quarter of 2013.